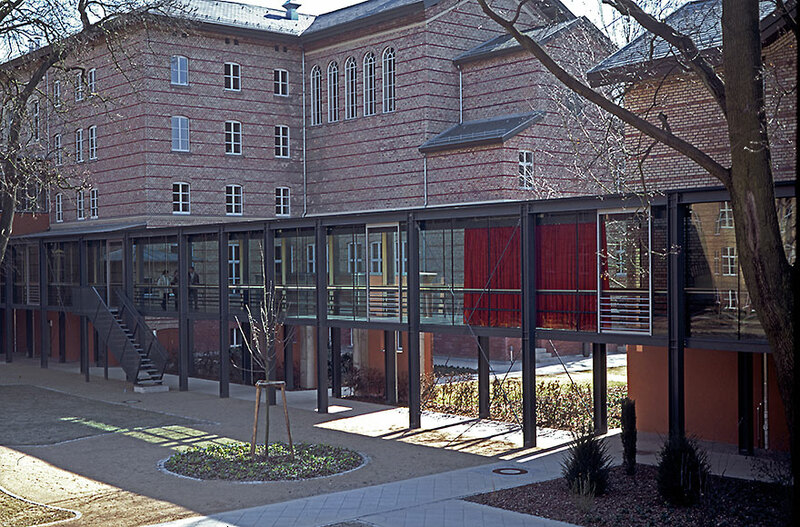 A 60 m elevated passage connects the main building of the hospital with the admin­is­tra­tive building, passing through the park and herb garden at a height of approx­i­mately 3 m. The passage is fully glazed on both sides and offers an unfet­tered view of the surrounding park land­scape. 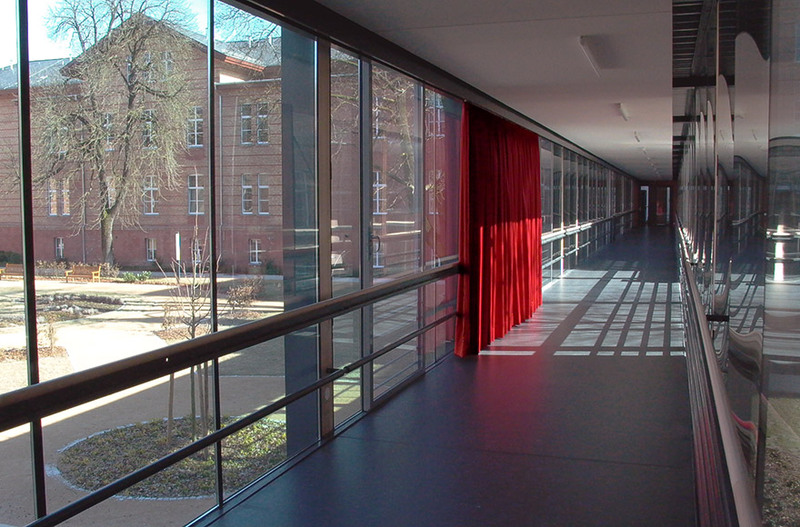 A curtain is suspended from a rail that runs along the entire length of the passage. In the tradi­tion of English home furnishing fabrics, it is made of fine, soft mate­rial, double-stitched and lined to create beau­tiful, uniform folds. With a width of 460 cm and a height of approx­i­mately 270 cm, it takes up one thir­teenth of the length of the connecting passage. By means of a motorised cable pull, the curtain moves very slowly, hardly notice­ably, along the entire glazed connecting passage over a period of 12 hours. The curtain is a frequent prop in the history of culture and art. In addi­tion to the discourse on folds, in which the harmony of the whole is empha­sised, it plays with curiosity, reality and imag­i­na­tion. In 1964, Jacques Lacan wrote: “If you want to fool someone, you only need to hold a picture of a curtain in front of him, i.e. the image of some­thing beyond which he wants to see.” The imper­cep­tibly moving curtain is about hiding and revealing, pres­ence and absence. 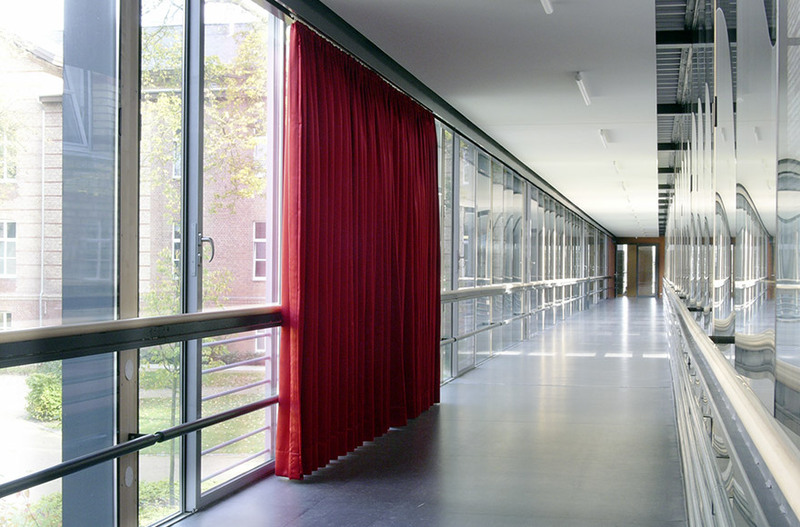 Every single posi­tion of the curtain results in a new situ­a­tion in front of and behind it. The staging of the space and the land­scape changes constantly. Made of fine mate­rial and with lavish folds, the red curtain creates asso­ci­a­tions with a stage curtain. 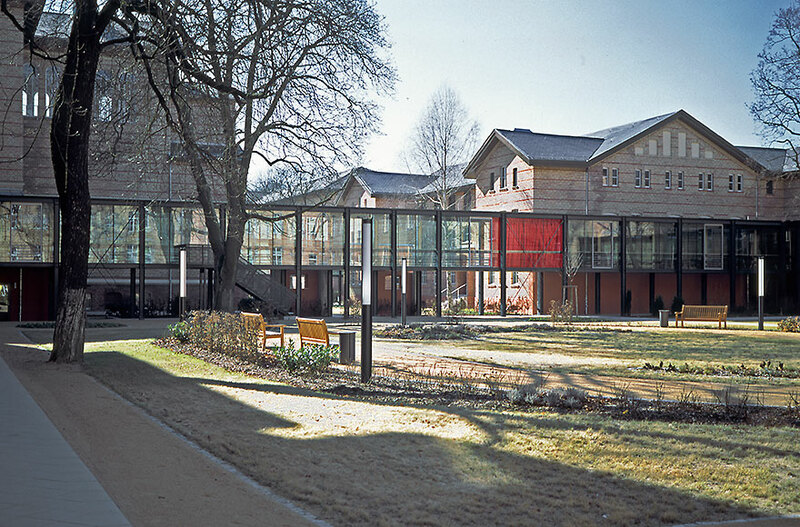 The elevated posi­tion of the glazed passage rein­forces this impres­sion and turns the land­scape into a stage. The title curtain.mov refers to the data suffix of digital videos. With its window grid, the passage is remi­nis­cent of the time­line of a video editing progamme, via which the surface of the red curtain moves in slow motion. At a constant speed of 1.2 mm per second, curtain.mov moves roughly 720 times more slowly than a person, who needs only a minute to walk across the passage. 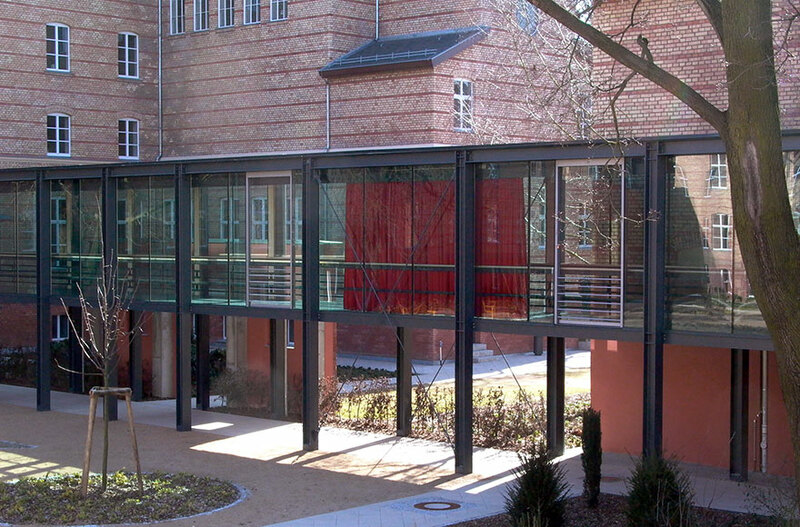 The mobile coloured surface of the curtain and the vertical steel girders create rhythm in the passage and its envi­ron­ment. The sections of land­scape are imper­cep­tibly yet contin­u­ously changed. The sight lines are struc­tured and accen­tu­ated. Land­scape and nature appear in frames with constantly changing propor­tions.